The Gardening-at-the-Crossroads blog is our way of keeping our readers informed about the ever changing seasons of the garden. Our page on Wildlife Gardening is great for the warmer months, but in the winter, a lot of us use supplemental feeders for the birds that stay around all year. We have our own Suet Cake Recipe that we use to provide winter nutrition for the birds. It costs about the same as the suet cakes you can buy in the store, but you know what's in it when you make it yourself. Garden pests, Yuck! What are these things and why are they eating my plants? Continue reading "Garden pests, Yuck! What are these things and why are they eating my plants?" The lily leaf beetle (Lilioceris lilii) is an invasive pest from Europe. Continue reading "The lily leaf beetle "
Continue reading "The Placebo Effect"
There are basic garden tools that every gardener should have. Honeysuckle can be a fragrant addition to your garden and attract hummingbirds as well. Clematis vines are easy to grow an add a vertical element to your landscape design. We get questions about saving seeds for next year. We wrote an Ezine article on saving Tomato seeds a few years ago that gave some basics. The Seed Savers Exchange has a series of webinars that explain seed saving in depth. These monthly events are invaluable for anyone interested in saving seeds. As we head into December, many folks bemoan the fact that winter is fast approaching and the winter solstice that occurs every December around the 21st is the shortest day of the year. While many people choose to dwell on this fact, we actually look forward to it as the day that the daylight hours start getting longer. An interesting astronomical fact is that while the winter solstice may be the shortest day of the year, the actual earliest sunset comes some three weeks earlier. It occurs this year on December 2nd in NE Ohio (Cleveland) when the sun sets at 4:57 EST. It stays at that time until the 15th of December and by the time the 21st rolls around we’ve actually gained 3 minutes at the end of the day. The sunrise continues to get later each morning until December 28th at 7:53 and doesn’t start receding until January 11, 2014, but by that time we’ve picked up 20 minutes in the evening. There are many celebrations in different cultures surrounding the winter solstice. Christmas is observed on December 25, which was the Roman winter solstice according to the Julian calendar. Many of the modern celebrations have their roots in ancient ceremonies. Yule or Yuletide was a pagan celebration by northern European cultures. Eastern Asian cultures celebrate the Dongzhi Festival. This festival traces its roots back to the yin and yang philosophy of balance and harmony. So maybe our happiness can be traced back to our German roots. In any case, the days will start getting longer and spring will only be 90 days away! You can calculate the above times in your area by going to http://www.timeanddate.com. Phalaenopsis orchids have brought the beauty of orchids to the average household. Continue reading "Phalaenopsis orchids "
With the popularity of coffee shops, one of our visitors asked if there could be too much of a good thing by adding a lot of coffee grounds to their compost pile. Gardeners have used coffee grounds for years to amend their soil. The grounds have fairly high nitrogen to carbon ratio and are slightly acidic so adding them to the soil around acid loving plants is beneficial.There is also evidence that slugs dislike crawling over the grounds which might be due to the scratchiness of the dried grounds, or maybe they just don’t like coffee. But getting back to the compost question, the answer is no, as long as you practice proper composting methods. If, by some chance, you develop a relationship with the local coffee shop and they keep their grounds for you don’t dump them in your pile in one spot. Remember composting works best when you have a mixture of ingredients that complement each other. Too much nitrogenous or carbonaceous material will throw the balance off. Household coffee grounds from one or two pots a day can be added with everything else. But if you come home with a five gallon bucket of grounds, add a couple of scoops every day and mix with drier material to keep the compost from being too wet. Like everything else in life, balance and moderation is the key to great compost. Fall is beginning at the Crossroads Garden with a cool and wet day. As the garden year winds down, this is a good time to reflect on the wins and losses this past year and start planning for next year. If you kept a garden journal look back at the notes you made and incorporate any findings into next year’s garden plan. Look at what varieties performed well for you as well as those that were disappointing and try to understand why they performed as they did. There are many variables that affect how plants grow such as sunlight, water, temperature, soil types, etc. Fall is also clean-up time. Just the other day, we got rid of the pole beans, Cathy canned the last of them and the vines went into the compost pile. The tomatoes will be next but the vines won’t go into the compost pile. The last couple of years we’ve had symptoms of late blight and rather than compost the vines, we’ll bag them up and put them in the trash, as much as we hate to do it, to control the spread of the virus that causes late blight. The same went for the squash vines that got hit with powdery mildew due to the wet summer we had. The pole beans were a favorite target of Japanese beetles this summer. Because we were late in getting the traps up, I spent many an evening flipping them into a container of soapy water. This is where good record keeping that is condensed into a garden plan comes in handy. Make a note in your plan for next year to remind yourself when to implement action steps to prevent certain pests and diseases. Like any plan, review your garden plan often; don’t let it sit on the shelf. Make it a habit to sit down with a cup of coffee on (pick day of the week) and review it to plan for what’s coming up. Our book-shelf has books for gardeners that we own and recommend. Continue reading "Books for Gardeners"
Summer squash such as zucchini produce male and female flowers. Male flowers are at the end of a stem and female flowers are usually lower on the plant, and are short and stubby in appearance. The male flowers are usually produced first and you may see quite a few of them before you notice the female flowers.Like most plants, the female flowers need to be pollinated or the fruit will not develop. If you have a lack of pollinators in your garden, then you need to hand pollinate the female flowers in order to have fruits that develop. The link below has some excellent tips and photos of how this is done. The above is true for any plant that has male and female flowers. Greens are nutritious and easy to grow. It's a beautiful late winter day here at the Crossroads Garden. I'm just taking a break from turning the compost piles and spreading some finished compost love on the garden. Our forecast is for high 50's and lower 60's for the next ten days if you can believe the weatherman, with no temperatures below freezing in the forecast. I think we'll get a jump on St Patty's day and plant the peas today or tomorrow. Only 10 days till Spring! This poster from the University of California shows some of the beneficial insects, mites and spiders that prey on garden pests. Now you know why you love to garden and miss it so much in the winter. Continue reading "This'll get you juices flowing"
Enter your ZIP code and look up your USDA hardiness zone. Continue reading "USDA Hardiness Zones"
The USDA released a new hardiness zone map of the United States. What this means to gardeners is that everyone generally skipped to a zone warmer than in the past. Personally, we will take a wait and see approach to this new map and not run out and buy some tropical plants for the yard. The new map is based on temps for the last thirty years, and it puts us in Zone 6a : -10 to -5 (F) but in our neck of the woods it's been colder than that 15 times in the last 50 years with a record low of -20 (F). As always these maps are not meant to be anything more than a guideline, so if you do decide to push it with your plantings, be prepared to take steps to protect them the next time the temps drop below "normal". Continue reading "USDA updates hardiness zones"
Beekeeping is a natural extension of your garden and it also helps the environment. Dividing hostas can be done easily, here are our tips! Season extenders such as row covers and hoop houses can add weeks if not months to your gardening season. 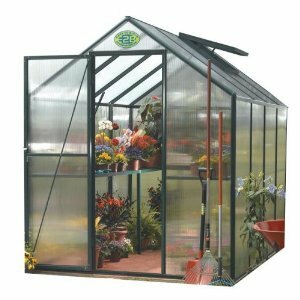 Cold frames and greenhouses can help you extend the gardening seasons. Sweet Peet is a remarkable product that's sold as a mulch, but works wonders as a soil amendment. If you are like us, the place where you start your seeds is a little out of the way (ours is in the basement). And as the old saying goes- "Out of sight, out of mind." So there's probably been a time that you've forgotton to water your little babies. Well here's a solution for you- Burpee's new Eco-friendly self-watering seed-starting kits available at Burpee.com. This kit comes with everything you need to get your seedlings off to a great start, you just add the seeds. The self-watering feature insures that the seedlings have an even supply of moisture- no more remembering to water the plants when they've already wilted! Plant Names can be confusing- they are often called by different names from vendor to vendor.